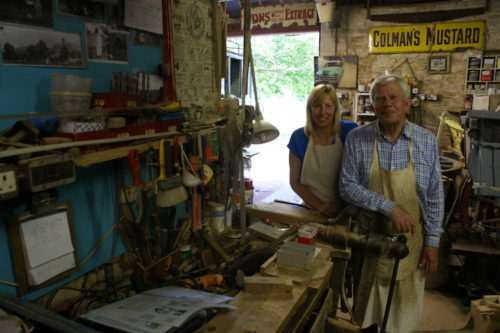 Terry Jenkins and Wendy Paterson overlook the organised chaos on the 150-year-old wheelwright’s workbench. ‘I know where everything is,’ Terry protests. With swallows flying overhead, a chicken scratching at the floor and the sounds of not very much passing by outside, wheelwright Terry Jenkins is immersed in the peace of his woody world. Wendy Paterson comes down to Terry’s thatched workshop at Scotland Farm on Hartland Moor near Corfe Castle at least once a week to learn new skills and hone the ones he has shown her. She’ll readily shave spokes for a cartwheel, make and shape a long handle for a wooden wheelbarrow, debark or split some ash or turn a finial for one of Terry’s beautifully rustic oak or ash bird boxes, that’s when she’s not helping in the restoration of a cart or making an oak bread board. ‘The rest of the world is a long way away when I’m here,’ she beings to explain. ‘I’m absolutely at one with myself and what I’m doing – to say this is satisfying doesn’t even begin to cover how I feel when I’m working. Like several other carts in and around the thatched barn that Terry has filled with jobs the bus has come from Honeybrook Farm, the family adventure park on Sir Richard Glyn’s Gaunts Estate near Wimborne. Heritage conservation and restoration has been Terry’s stock in trade for more than twenty years since he packed up a 32-year career as a male nurse and retired to fill his time with the things he loves – old carts and industrial or agricultural ephemera. He’s almost, but not quite, as pleased with the eel net he picked up in Dorchester recently as he is with the wheelwright’s platform he dug out of a hedge near Longham a few years ago. Terry is justly proud of his wheelwright’s workbench. It’s more than 150 years old with a massive vice at one end and a wooden corkscrew device at the other and a series of drilled holes along its front lip where pegs were fitted to rest spokes for planing. Outside under canvas is the 1911 Governor’s cart that was his first restoration – a natural extension of his lifelong passion for precision model making – and he hopes to have the wheels back on it later this year, time permitting. ‘We do all sorts of different things here but I call myself a wheelwright if only so that the word doesn’t die out – I mean, what young person these days has heard of a wheelwright?’ he asks, slightly incredulous. Also awaiting restoration are an old wagon once used to haul hemp by a Bridport rope makers and another dust covered cart that belonged to Oxenbury the builders (now a car and bike body repairers), also in Bridport. There are future projects all around the workshop and its immediate vicinity, as well as the walking sticks, ash rakes and hurdles, bird boxes, and other bits and pieces Terry makes to sell to visitors that look him up. He has no use for websites and emails; work still finds its way to him and Terry is always on the look out for new restorations. 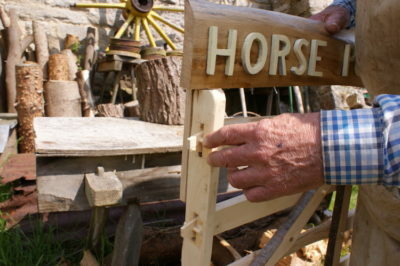 ‘We just did an old rocking horse that I don’t think had ever been rocked,’ he says. ‘It needed a leg mending and the rocker put on. By the time it was done the customer couldn’t tell which leg had been repaired; beautiful it was. These are the skills being handed on to Wendy now and one or two others. ‘It’s all women though – don’t ask me why but it’s always the women that buy and they nearly all want the rustic look, rough cut hurdles, shelves, handles, sometimes with the bark left on. Also, it seems to be women that want to work wood. We had a family in the other day and the mother said her daughter was interested. • First published by Dorset Life the Dorset Magazine.